Love the movie The Artist? Not seen it yet but want an idea of what to expect on a much smaller scale ? The folks at Leonor Greyl haircare, who prepped Oscar winner Jean Dujardin, star of The Artist for Sunday's show have out together their own cute short film and yes, it features a dog. Rebecca Minkoff bags are pretty fab but they also don't come inexpensively. Well now there's a way. Minkoff has teamed up with mark for this cute studded bag created just for them. It's $ 60.00 and features the designers signature key clip and business card pocket with Rebecca Minkoff ❤ mark. It has 3 interior pockets , 1 zippered pocket at back and 2 slit pockets in front. 113/8" L x 8" H x 17/8" W (22" L handle drop). I'm not doing much in the way of the Oscar beauty round ups, because let's face it, everyone else is practically. You'll see more red carpet coverage than you can imagine, right ? But I am doing Glenn Close. Why ? Because she looked amazing with her freshly blonded hair and perfect shade of lipstick and I bet that almostt no one features her since she isn't a starlet of the moment. No, she's a star and a lady, more like a dame. She worked a green Zac Posen dress and her makeup was all by Chanel. Foundation: CHANEL Vitalumière Aqua Ultra-Light Skin Perfecting Makeup SPF 15 ($45.00). 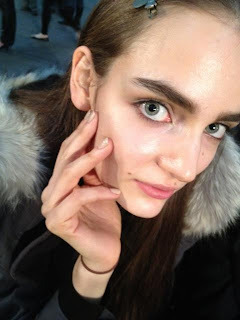 It was set and finished off with CHANEL Natural Finish Pressed Powder in Translucent 1 ($45.00). Eye Shadow: I covered the lid with the shimmery CHANEL Illusion D'Ombre in Émerveille ($36.00). I then blended the darker green shadow from CHANEL Quadra Eyeshadow in Lilium ($58.00) up to the crease creating a soft, classic smoky eye. Lipstick Lastly, I applied CHANEL Rouge Coco Shine Lipshine in Unique ($32.50), a reddish berry pink with gold sparkles. 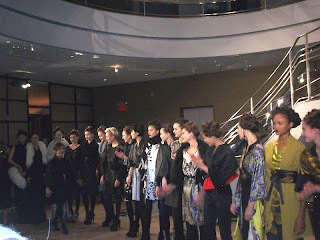 Josie Natori showed her fall ready to wear line at the lovely Rubin museum on Valentine's day. 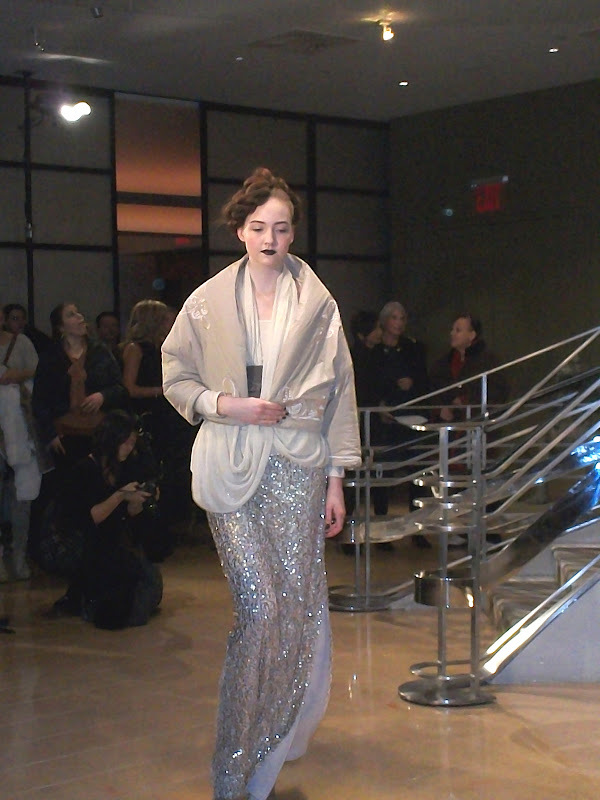 The show was full of tailored, elegant pieces often Asian inspired and a mix of cozy and luxe. The black evening dress, seemingly so basic from the front, was a showstopper when we got a view of the lacy, open back. Way to make an exit. 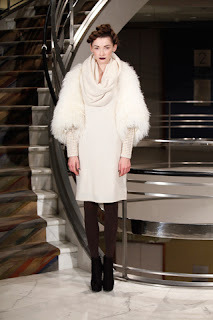 I also loved many of the sweater separates all done with a luxurious but semi casual look not unlike her fabulous lingerie. Time to pop in with a little round up of some of my recent pieces for Loving You. I tell you how to get the Downton Abbey look , go backstage at NY fashion week and talk heart health and red dresses. Part of the Queen line but not simply for darker skin tones, the new Cover Girl Vivid Impact Eyeliners are really nice . Pigments for the most part are deeper but not all of them are. 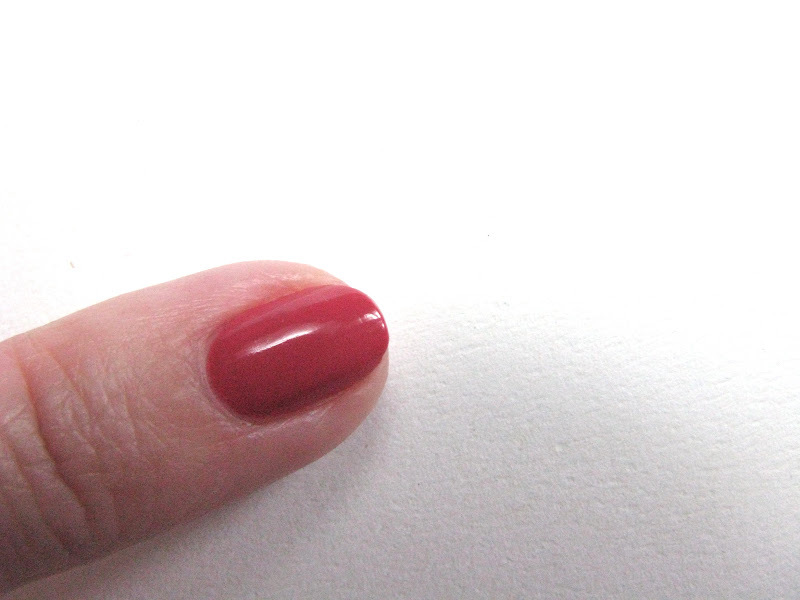 The Amethyst shade for instance is a light plum . And the golden olive Gilt isn't too deep either. 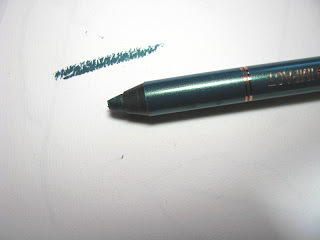 The green shade, Jade, however is super pretty but more bold, so if you're looking for a deep green this is for you. I really like all the colors here and of course there is black as well( Midnight shade). 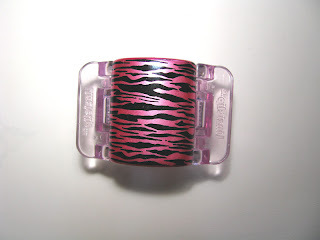 These go on smoothly with no pulling , last nicely and the other end has a blending sponge. L'Oreal's new skincare serum, Age Perfect Hydra Nutrition Advanced Skin Repair Serum , has me very impressed. And I have to say besides the Golden Balms, it's the first L'Oreal in the skincare area that I feel that way about. For some reason previously I just didn't have much love for their skincare. They got me with the Golden Balms and now this new serum. I love that for $ 19.99 you can get a good product that works. I noticed a brighter complexion the next morning after using it. After more use skin looks brighter yet. Now it's only a little difference but that's still quite good. The serum is thicker than many I've used , has a lovely citrus-y scent and moisturizes well. For my combo skin it's enough on it's own. If you have dry skin you may feel you need more moisture. 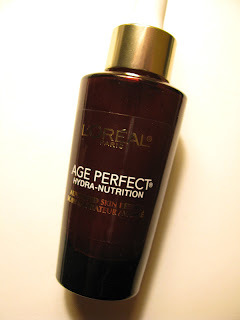 L'Oreal says that the serum helps to redensify, hydrate and even out skintones. I haven't used it long enough to talk about skin density ( and I think mine is good to begin with since I don't fall into the "mature" area ) but as I said I think it does a good job on skintone and hydrates nicely. 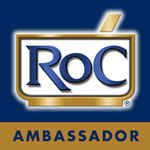 Ingredients include Bio Peptides from their Nutri Repair Complex and Ceramide Fortifiers. New from MAC is Sheen Supreme Lipglass in the Too Supreme collection which also brings new shades of the really wonderful Sheen Supreme lipstick. The inspiration is East Asia Chic. 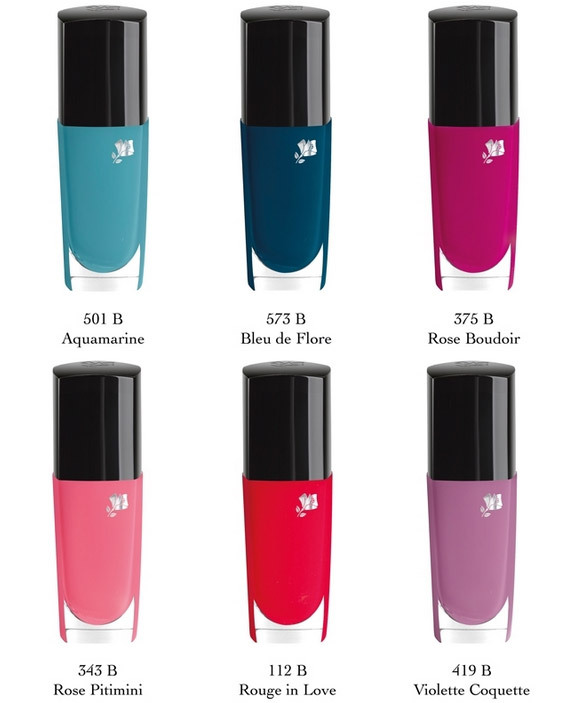 Sheen Supreme lipglass will come in a clickable open applicato, in 11 shades. They will be available March 1 thru April 5th. Banana Republic has always done really nice fragrances, I think. That's unusual for a store branded scent. Remember Rosewood and Alabaster of about 5 years ago ? I still have some tiny samples of those. Their newest scent is Wildbloom Vert, a companion to last year's Wildbloom. Think spring and early summer in a bottle and you've got Wildbloom Vert. 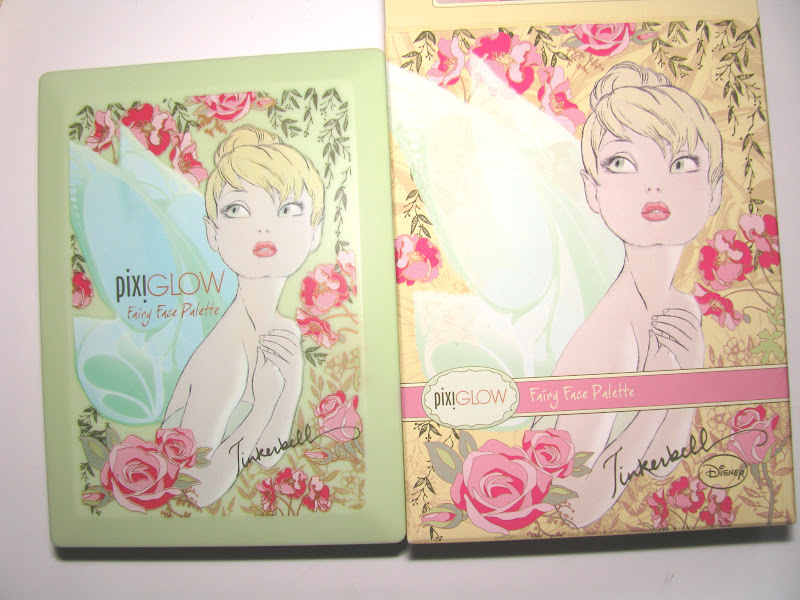 It helps , too, that the packaging is adorably pretty. I get plenty of green tea and green notes aka the "Vert" but with lots of fruit, not super sweet fruit, but summer fresh fruits. There is apple, pear and peach in there but my nose doesn't get too much of the peach, mainly some crisp pear. It does remind me a little of the green tea scents that have gone before but it's also different than those. Fresh and just a little aquatic, with dewy white florals all underlined by the green notes ( the main green note listed is violet leaves) . The drydown becomes more green and less floral , a little dry and crisp with ,to me, a little grass in the finish . Not your typical sugary fruity/floral, thankfully . Wildbloom Vert has medium sillage and lasts nicely. It has a sunny personality that is appealing. It's a great heading into spring scent that will be just as nice come summer. 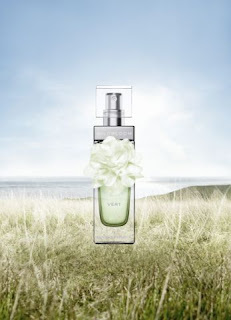 Other notes listed are gardenia and magnolia, teak , sandalwood and soft musks. $ 42 at all Banana Republic stores . New from Scunci is the Linziclip®. 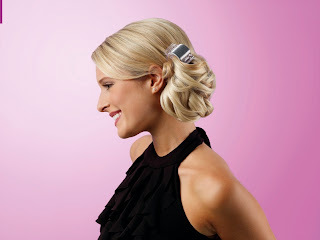 Think a claw clip for your hair, but one that lays flat. Yes, we needed that. With the Linzi you can lay your head back and not have this big piece sticking out. The Linzi comes in 2 sizes. Midi and Maxi and fun colors too. Mine is a Midi size . It's does the job well for up to medium length hair. Longer will need the Maxi. 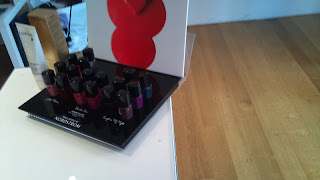 While at fashion week I had a chance to try the new Vernis in Love nail polish from Lancome. This new polish comes in 17 shades and coordinates with the new Rouge In Love lipsticks. The bottle is a new design as is the brush, said to be easier to use and "mistake free". It certainly was easy enough for the nail tech and I was done ,polish and top coat quickly. 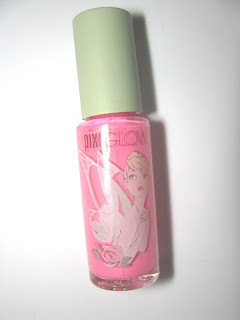 My shade is Rose Pitimini . These have good shine even before topcoat and it lasted long. 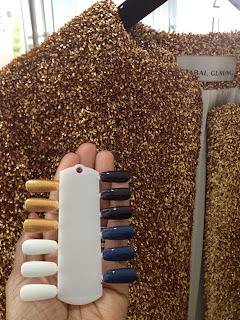 A week , with some tip wear by day 5, but I am very hard on my nail tips. I tend to get tip wear fast no matter what polish it is. 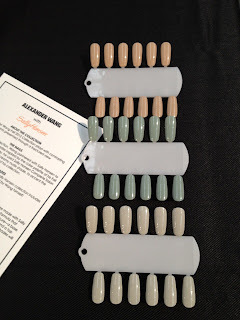 At Chris Benz's fall fashion show last week this was the polish used on the models. 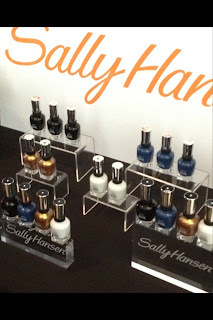 Shown in pic is Noir Caviar, a dark-gray-almost-black shade , topped with a matte finish. During fashion week Total Beauty debuted a new live series called Total Beauty Live. 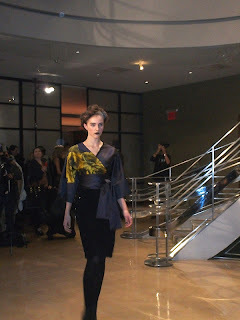 The first show was at The Empire Hotel rooftop lounge and features Jill McKay , currently the makeup artist for The Chew TV show as well as Total Beauty's Dawn Davis and was sponsored by NYX cosmetics . Jill answers readers/viewers questions and offers tips . NARS new Pure Radiant Tinted Moisturizer is pretty amazing. I am generally not a TM fan, there's not enough coverage and too much moisture. Well NARS really gets it right. It's more like a BB . This has coverage, not as much as foundation but more than your average TM. It smooths and perfects with light coverage and just enough moisture to feel good but not too much. ( It's oil free). 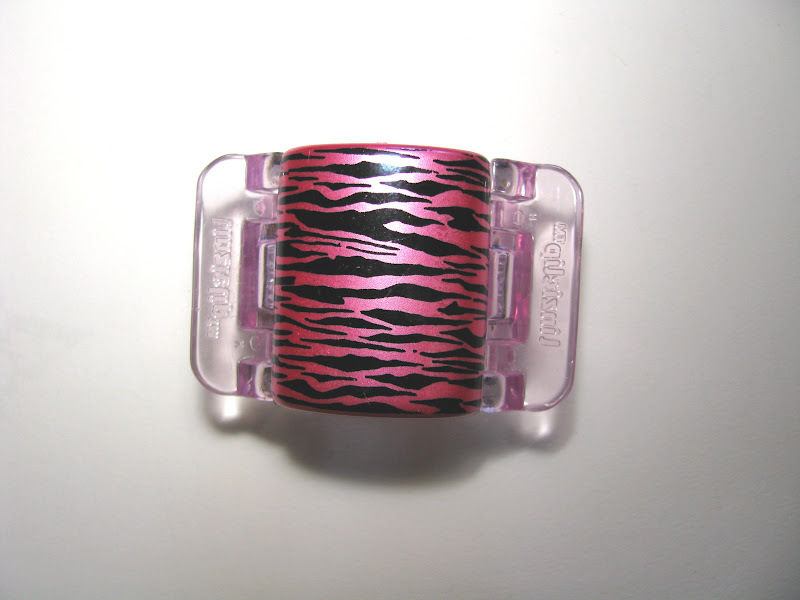 There's no shimmer but it gives you a great glow. Good for skin ingredients include Galaxuara, a deep sea red algae known to be calcium rich and have vitamins A and E . Then there is SPF of 30 for high protection. I have the shade Alaska which is the second lighest. It's almost too dark for me but I blend it in well and it looks fine and undectectable. It looks dark in my picture but it goes on a little lighter and does blend. The lightest shade , Finland, I was afraid would be too light. But as always test out what works for you, especially if you're in between shades like I seem to often be. NARS has gone across the shade spectrum here with 9 in all so there should be one for every skintone. Pixi's PixiGlow line is all about pretty makeup colors and Tinkerbell. 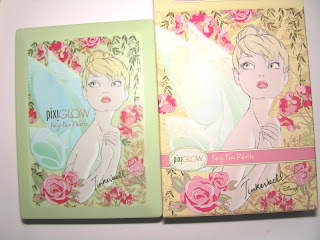 The Fairy Face palette is for the pink lovers with with a shimmery medium pink blush , baked eyeshadows in shades of neutrals and pinks and a nice selection of lip colors. It's very girly , sweet and almost a little Victorian . If you love Disney ( and don't most of us?) it's one you 'll want . 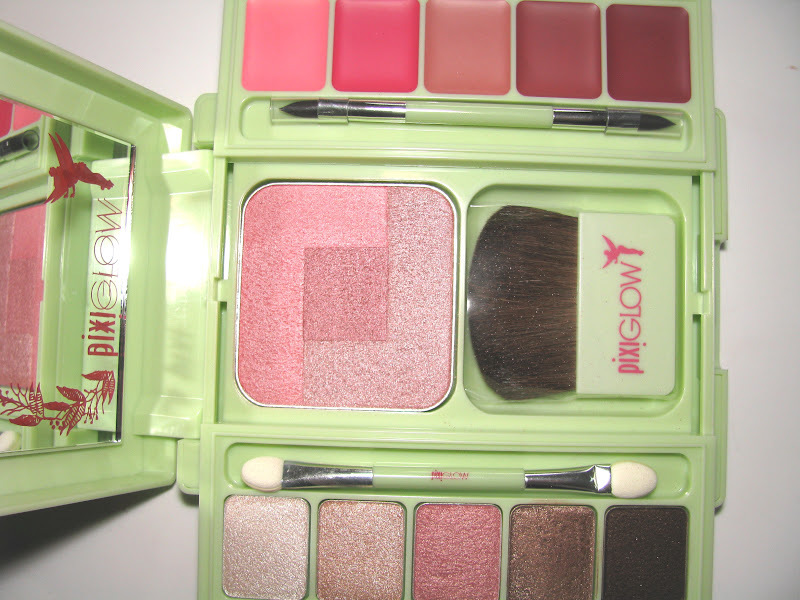 The eyeshadows go on really smoothly and the blush is a great shade that brightens and should work on most skintones. 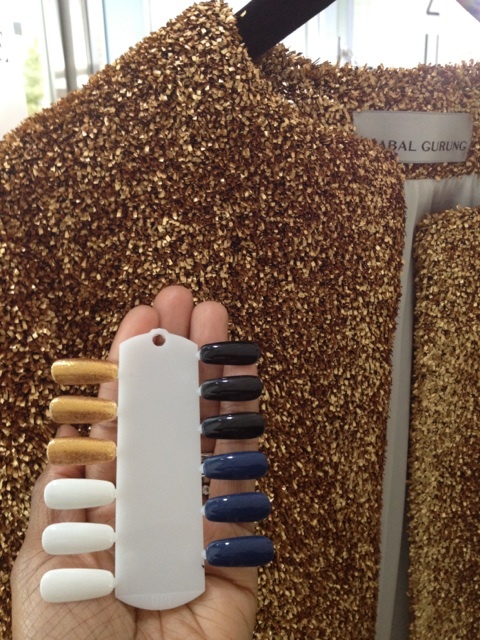 My favorite item in the line is the nail polish. I think the bottle design is just too cute and despite not usually gravitating towards pink, I love the bubble gum pink shade. So spring like and sunny. It has a little shimmer but dries more satin . The PixiGlow line is available at Target.com now and in Target stores in March. 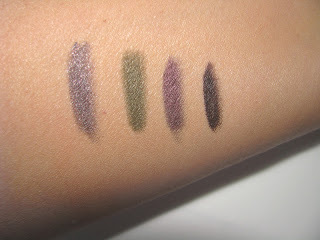 Also in the line are a fab olive green eye pencil, a pale gold eyeshadow crayon and a highlighter liquid. 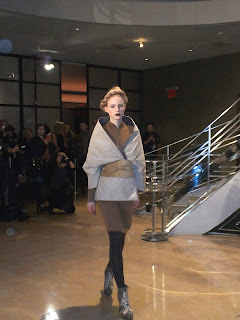 Ruffian's fall show was one of my favorites. 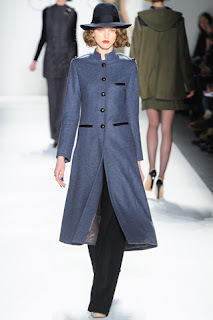 Glen plaids, bright plaids, tailored coats, hats, hats and suits in cobalt blue were part of the looks that went down the runway. 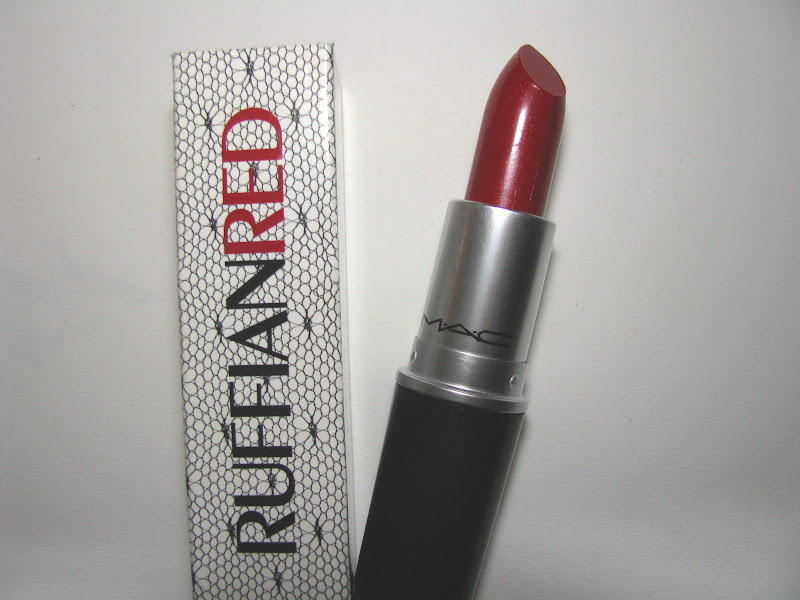 Also MAC announced not only the return of Ruffian Red, the very LE lipstick from several seasons back, but that they will be collaborating with Ruffian on an entire makeup collection come this June . Stay tuned. 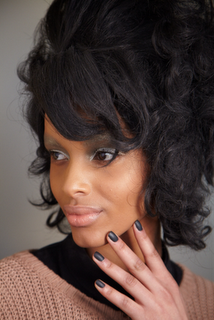 As always NARS is debuting several new products for fall backstage at fashion week . There will be a new Multiple as well as an eyeshadow duo and more . I've highlighted the new items in bold. Yes that's right, fall 2012 is getting it's sneak peeks in from the New York shows. 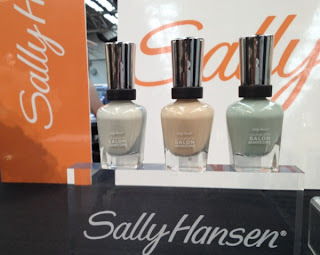 Sally Hansen revealed 2 of their designer collabs yesterday, one with Alexander Wang and one with Prabal Gurung , whose show by the way was a s delicious at the nail colors. These will be on sale in September , part of the Complete Manicure line. So far the info I have is the beige shade at Wang is Bandage and the greyish green is Pumice. 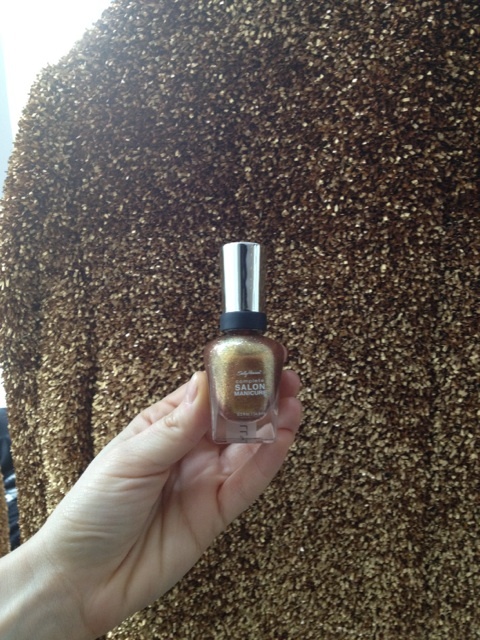 Blue Rose is the blue from Prabal and the gold is Gilded Lily, inspired by the matching dress.